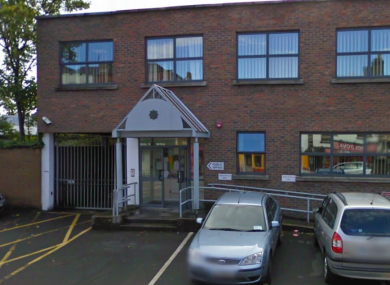 Rathmines Garda Station, where one of the men is being held. TWO MEN HAVE been charged following an attempted robbery in south Dublin that was foiled by an off-duty garda. The garda spotted two males entering a shop on Lower Mount Pleasant Avenue in Ranelagh yesterday at 6.45pm, with their faces covered and what appeared to be a firearm. He confronted the two in the shop, and after a struggle arrested a man in his 20s at the scene. The second man injured the garda’s hand after attacking him, and fled the scene. A juvenile was arrested late last night at 11.30pm. This evening, gardaí said that the two males are scheduled to appear in court tomorrow morning to be charged in connection with the incident. Anyone who was in the area of Mount Pleasant Avenue or Mount Pleasant Square yesterday evening between 6 and 7pm is asked to contact Rathmines Garda Station on 01 666 66700, the Garda Confidential Line on 1800 666111, or any Garda Station. Email “Two men charged after attempted armed robbery foiled by off-duty garda”. Feedback on “Two men charged after attempted armed robbery foiled by off-duty garda”.